I recently reviewed Terry Lindvall’s latest book, God Mocks, a central theme of which is that if we want to hear the prophetic word of God, we better look and listen in the most unlikely of places. Last month’s release of the first issue of The Goddamned by Jason Aaron and r. m. Guéra bore this out as well. The second issue , “The Beasts of the Field,” only raises the bar. If you’re at all interested in the intersections of theology/religion and pop culture, you should be reading this series. I don’t want to give away too much of the plot, but it continues Cain’s quest for death. We learn of how he’s tried and failed to kill himself. We see Noah, who showed up at the end of the first issue, in the midst of his epic building project. Cain learns that this mysterious figure might have something to help him end his quest. Aaron and Guéra set a gripping tone in the first issue with their uber-violent and gritty portrayal of stories that preachers and ministers far too often sanitize. In this second issue they reveal their in-depth theological, philosophical, and narrative engagement with the text. Two issues in and it already feels like they’re thinking more deeply about the implications of these stories than many ministers I’ve heard preach on them. In this way, they fall in line with Darren Aronofsky and his recent controversial Noah. One wonders if their detractors are so upset because they know they’re not taking these texts as seriously as these artists. “The Beasts of the Field” sheds new light on the curse God places on Cain and implies that it was a fate worse than death. It forces readers to consider the environmental consequences of Noah building the ark. It also poses similar questions to the idea of the animals flocking to the ark and whether or not they would have done so simply two-by-two as we learned in Sunday school. 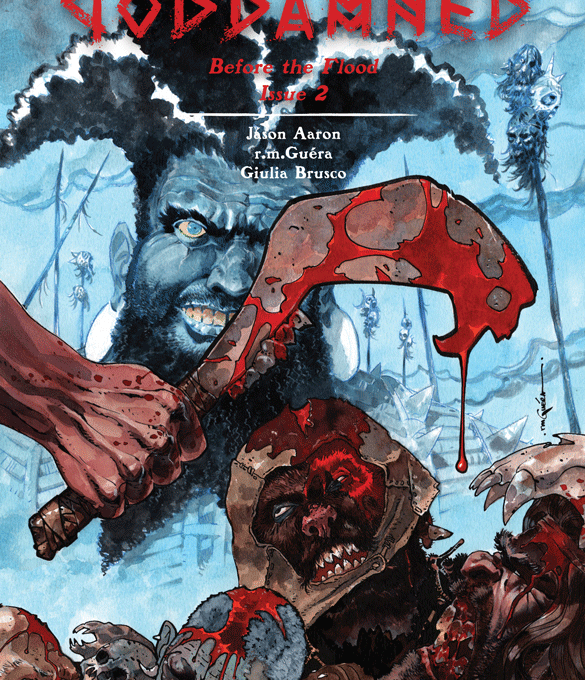 The third issue of The Goddamned goes on sale Wednesday, January 27th.